Fig. 1. The new Queen’s Window, designed by David Hockney, created by Barley Studio, in Westminster Abbey. On October 2nd, a new stained-glass window designed by the artist David Hockney was dedicated by the Dean of Westminster, having recently been installed in the Abbey’s north transept. The so-called Queen’s Window commemorates the 65th year of the reign of Her Majesty Queen Elizabeth II. The design is based around a vibrantly-coloured image of a blooming hawthorn: a tribute to the Queen’s love of nature, and, perhaps, a reference to the use by the Queen’s royal ancestor, Henry VII, of an emblem depicting the royal crown nestled in a hawthorn bush. Hockney has flagged his use of an iPad in designing the window, noting that, being backlit, like stained glass itself, the device allowed him to understand how his design would appear once installed. A piece of glass on which Hockney painted his signature is incorporated into the window, but otherwise the design was translated into glass by a team headed by the stained glass artist Helen Whittaker, of Barley Studio, York. Previous issues Vidimus (issues 109 and 117) raised awareness, and reported on the success, of an urgent appeal to raise more than £25,000 needed to conserve and restore the beautiful late-medieval stained glass at Birtsmorton (Worcs.). Fig. 1. Kneeling armoured figure, Birtsmorton church. Fig. 2. The Baptism of St Christopher, Birtsmorton church. On Sunday, 16th September, the church held its first Heritage Open Day to celebrate the start of the restoration project, by Holy Well Glass, to return it to its former glory. The late-fourteenth century glazing includes two images of kneeling armoured figures, probably representing members of the Ruyhale family, believed to have donated the glass, and the remains of a highly-unusual image of Christ baptising St Christopher. Fig. 1. Strawberry Hill House, Horace Walpole’s ‘little gothic castle’, following recent restoration. More than 170 years after it was dispersed in a 24-day ‘sale of the century’ in 1842, the art collection of Horace Walpole is returning home. Following years of detective work, underpinned by Walpole’s extensive descriptions of his house and its contents, more than 200 works have been reunited with the spaces originally designed for their display. Brought together for a once-in-a-lifetime exhibition opening later this year, the collec-tion includes highlights such as Reynolds’ painting of Walpole’s nieces, The Ladies Waldegrave (now in the National Gallery of Scotland); the rosewood cabinet designed by Walpole, owned by the Victoria & Albert Museum; a portrait of Catherine de Medici, sketched from life by Jean Clouet; and, intriguingly, an Aztec obsidian mirror used in the magical rituals of Dr John Dee, Queen Elizabeth I’s ‘conjuror’. Walpole’s own descriptions of his ‘little gothic castle’ provide, in many cases, a guide to where and how his works were originally displayed. A sense of how they were originally perceived and experienced can also be gained thanks to the extensive restoration work undertaken at Strawberry Hill over the last decade or so, and, not least, through the retention of much of the house’s collection of stained glass: vital in creating the sense of ‘gloomth’ Walpole so delighted in. The exhibition, ’Lost Treasures of Strawberry Hill: Masterpieces from Horace Walpole’s Collection’ runs from 20th October 2018 until 24th February 2019. To book tickets, and for further information, see the Strawberry Hill House website. Thoughts are turning to Christmas at the Stained Glass Museum. This workshop provides the perfect chance to create your own festive decorations, ready for the Christmas season. 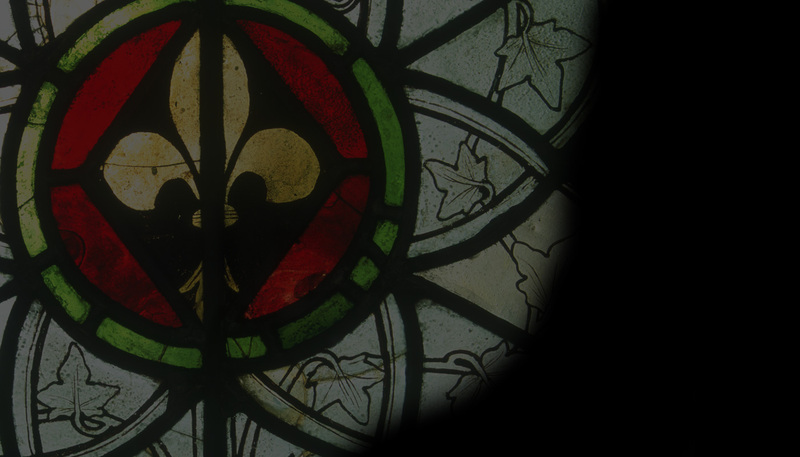 For further details, see the Stained Glass Museum website. Thursday, 15th – Saturday, 17th November 2018. The Stained Glass Museum will be open as usual during the Christmas Fair, and will also run a stall in the nave. Due to the popularity of the event, it is recommended that tickets be purchased in advance via the Cathedral website. Looking ahead into the New Year, the Museum has also announced details of its 2019 Study Weekend. Taking place between Thursday, 25th and Sunday, 28th April, the weekend will be based in Bradford and will explore the wide range of stained glass, both medieval and more modern, to be found across the boroughs of Bradford, Dewsbury, Halifax, Huddersfield and Leeds. Fig. 1. St Peter and two apostles from the Death of the Virgin panels now in the east window of Normanton parish church. Anticipated highlights include the 15th-century windows at Thornhill parish church; the collected medieval glass at Normanton; the spectacular collection of Swiss panels now at Wragby; Leeds and Halifax Minsters; and the beautiful Burne-Jones, Rossetti and Ford Maddox Brown glazing at Bradford Cathedral. The weekend is co-organised by Jasmine Allen, Curator of the Stained Glass Museum, and Chris Parkinson, co-author of the forthcoming CVMA volume on Essex. They will be joined by Brian Sprakes, author of The Medieval Stained Glass in South Yorkshire, who is currently working on the CVMA volume for West Yorkshire. For further details, including pricing and accommodation, see the Museum’s website. NB. The Stained Glass Museum and gift shop will be closed to the public between Monday, 15th October and Thursday, 8th November to allow for the safe removal of scaffolding following the recent South Nave Aisle roof repairs. The Glaziers’ Company is now inviting entrants to its prestigious annual Stevens Architectural Glass Competition. The competition, running since 1972, this year requires entrants to design a stained glass window to be installed in the patient reception and waiting area of the Proton Beam unit currently under construction at University College Hospital, part of the University College London Hospital NHS Foundation Trust (UCLH). In addition to submitting a design for the window, entrants are also required to illustrate the design by preparing a specimen stained glass panel. The competition is open to all those at an early stage of their career, including student stained glass artists and designers as well as those who have commenced their vocation in glass within the last eight years. Past Stevens Competition winners have gone on to international acclaim. Winners are awarded cash prizes, and one entrant may have the chance to see their design realised. In recent years, the competition has led to several prize-winners receiving commission, some of which have helped to launch the careers of talented glass artists. Entries to the Stevens Competition must be received at Glaziers’ Hall, 9 Montague Close, London SE1 9DD, no later than 5pm Thursday, 4th April 2019. This year, for the first time, a prize of the value of £500 is also being sponsored by the ‘Reflections of The Lord Mayor’ for the design of a panel by those aged 16-24 years. This competition is intended for those with little or no experience of working with stained glass but who would like to develop their design skills. As such, entrants are not required to prepare a stained glass panel. Entries to the ‘Reflections of The Lord Mayor’ competition must be uploaded and received via WeTransfer no later than 5pm Tuesday, 5th March 2019. For further details and an application forms, please see the Glaziers’ Company website. Fig. 7. Detail from the Great East Window, York Minster (Photo York Glaziers Trust, reproduced courtesy of the Chapter of York). This Autumn the University of York is celebrating the tenth anniversary of the launch, in collaboration with the York Glaziers Trust, of its MA in Stained Glass Conservation and Heritage Management; and, ten years on, it will revisit the subject of its very first master-class: the conservation of the Great East Window of York Minster. This day-long event will take place at the King’s Manor, York, on Saturday, 10th November, between 09.00 and 18.00. The University of Lausanne, the Château de Nyon and the Vitrocentre Romont will host an international conference on Friday, 2nd – Saturday 3rd, November. Hosted by the Château de Nyon, Switzerland, it will explore the themes of new glass technologies around 1900; glass and new building materials at the end of the nineteenth and the beginning of the twentieth centuries; and the restoration and conservation of this glass in architecture one century later. For further information, please contact Isabelle Le Cocq or Frédéric Seiler. Fig. 1. Burrell at Kelvingrove: Collecting Medieval Treasures. A new exhibition, curated by Sir Paul Ruddock, former Chairman of the Victoria & Albert Museum, London, has opended at the Kelvingrove Art Gallery and Museum, Glasgow. Burrell at Kelvingrove: Collecting Medieval Treasures draws on the outstanding collection of medieval sculpture, stained glass, metal, ivory and ceramic works brought together by Sir William Burrell (1861-1958), and is the latest in a series of exhibitions held at Kelvingrove demonstrating the range and quality of the Burrell Collection whilst the listed buildings that typically house the collection in Pollok Park are undergoing restoration and refurbishment (due for completion in 2020). Join James Robinson, Director of the Burrell Renaissance project, as he talks about what makes Burrell and his medieval collection so special for him and curators the world over. The curator of the Medieval Treasures exhibition uncovers the dramatic stories behind Burrell’s painted tabernacles: one of the highlights of his world-renowned collection of medieval English alabasters.